I have worked in many fields of lighting for almost 15 years. The more I learn the more I realise how little I know. It makes me humble and enthusiastic to all the aspects of light. 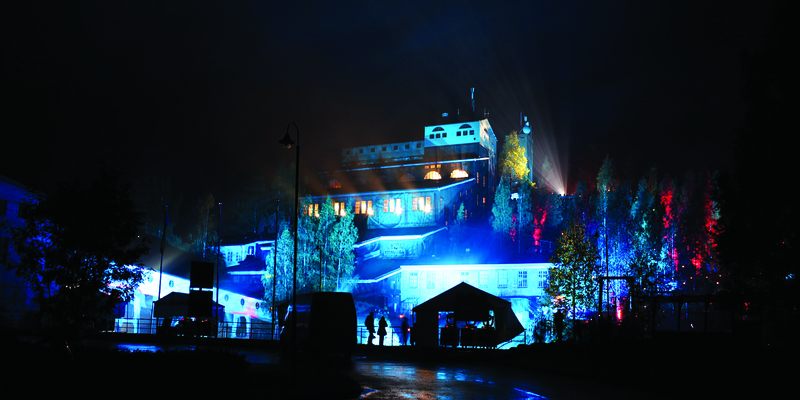 Last fall I was wondering what will happen in the opening ceremony of the International Year Of Light and asked about it to my friend Pasi Vahimaa (Professor of photonics / IYL 2015 National contact for Finland) . We had a conversation and I proposed that it would be really nice to do something in large scale. Then Pasi introduced my idea to John Dudley (Chair of the IYL 2015 Steering Committee). I proposed to John that I really would like to do something and he said yes. I got very excited and happy even though I needed to get most of the funding for my project and the timetable was really tight for a project of such scale. 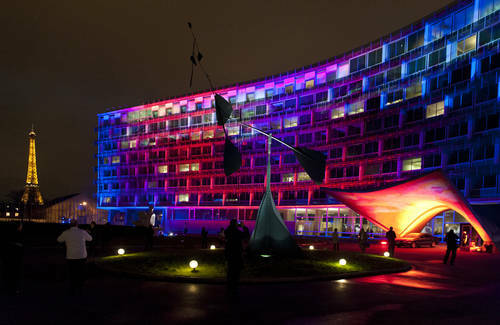 Light is Here Installation at UNESCO HQ during the IYL 2015 Opening Ceremony. Credit: UNESCO. To prepare the project, I started to wonder from where I have I learned the most. What is the strongest and the most important thing about light to me? Since I live in the North the answer was clear. I decided to use the theme of Northern Lights (Aurora Borealis) and sunrise (Aurora) in the piece. And of course, just to make it bit more harder, I wanted to do this in 360-degree covering all sides of Unesco HQ in Paris. Scheduling the whole process was very intense. There were only two months to make all the planning including concept, music composing, technical details, crew, equipment, transport, etc. So I started to call friends in the field of lighting to know if they would join the journey to make something really special. I wrote the concept of the installation and we started working. The planning was aimed to make really fast build up in technics and really strong atmosphere and concept for the Opening ceremony. I was privileged to get precious help from Unesco and from the IYL 2015 team. It was also an honour to work with students from all around the world. They really helped me on the build up on site. I collected a team from Finland, Portugal, Netherlands and backups from France and Denmark. I had privilege to work with specialists in different fields. We built up everything in one day and during the second day we just cleaned places and programmed and synced everything. I used more than 200 different hi-power LEDs, 12 video-projectors (Video content from Nuno Maya), special effects and soundscape. It was, as planned, a 360-degree installation and for me this was a dream come true. It’s been a long way from the Eastern part of Finland to come to Paris for an occasion like this. It wouldn’t have been possible without people who are around me and inspiring me all the time. Living mine Installation in Finland. Credit: Kari Kola. Now I’m working in multiple light-art pieces for this year. Some of them are more than 2-hectar sized outdoor pieces. Tampere Lightweeks (oldest light happening in Finland) is celebrating its 50th anniversary and I will make big scale dynamic installation. In the SIGNAL-festival (Prague) I will make an installation for one of the islands located in the river at the centre of town as well as one special video piece to my hometown Joensuu. That will be my ’10 years as a light artist’ piece. Nordic Elements Installation in Portugal. Credit: Kari Kola. I’m always trying to learn more and I’m open to possibilities that light will bring in life. Even though I have worked with light for a long time, it’s still like a big playground for me. Creating big illusions and atmospheres with light is my passion and I think I’m just getting started. I’m also finally opening a website about my works, because many people have asked about this. There is lots of symbolic values and positive aspects in light that we should remember more, it affects in really many ways how we are, how we feel, how we see things and lots more. The world needs light now more than ever because of all the positivity that there is in light. I think that nothing is impossible; it is just a matter of deciding how much you want to use your energy towards achieving it. 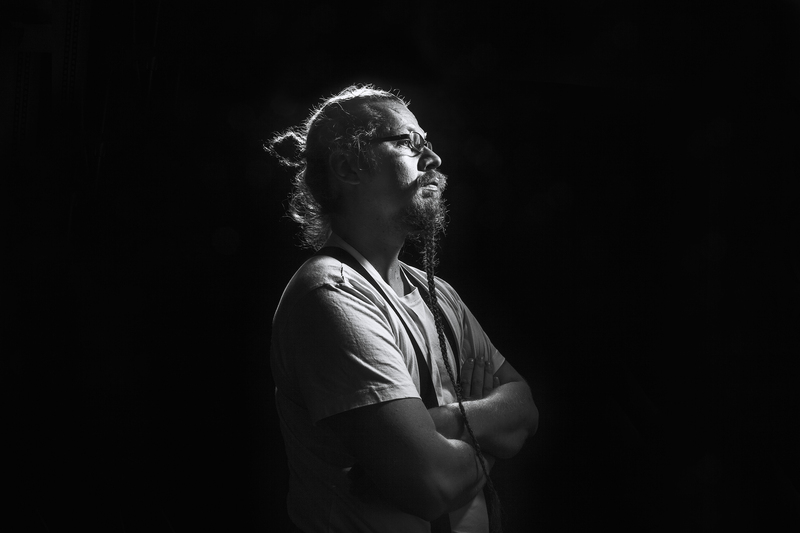 Kari Kola is a lighting designer and a light artist. 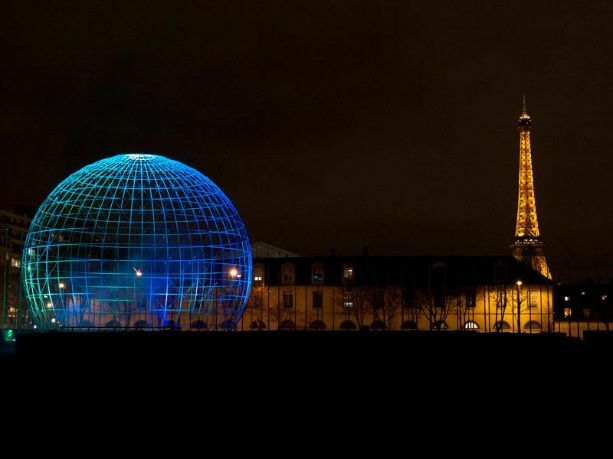 During the last 15 years he has designed and executed lighting for many operas, musicals, plays, concerts (classical, pop, rock), landscapes, festivals and dance pieces. 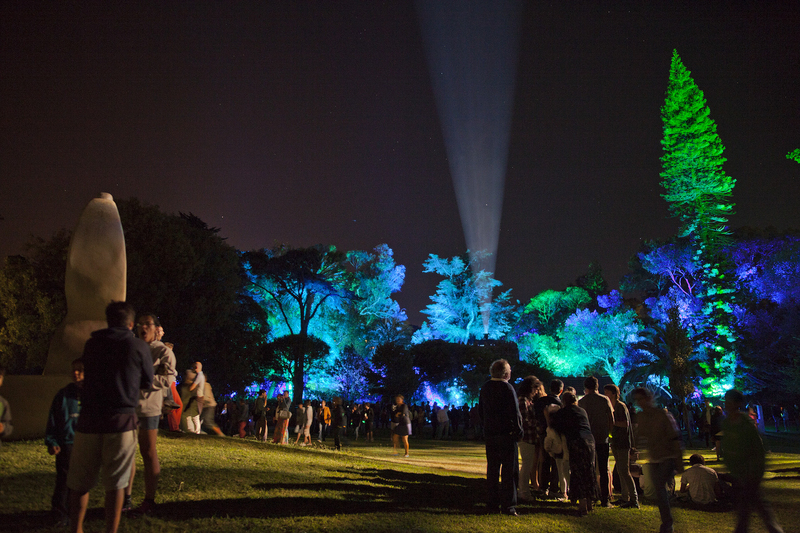 He has also carried out many sizable (over one hectare in size) light installations outdoors, designed multi-channel soundscapes and taught in different fields of lighting. Over the years, Kari has worked both as a technical and an artistic leader in several productions. His specialty is mixing different art forms when creating a show or an installation. Examples of these include dancers, aerial acrobats, pyrotechnics, lasers, special effects, multi-channel audio, ice and snow, ice skaters and painters. Large outdoor installations are his greatest passion and main expertise. He has executed many of these under very demanding conditions, for example, with temperatures under minus 25 degrees Celsius. From these experiences he has acquired a lot of valuable know-how knowledge. Helsinki illumination at winter evening.